Earlier this month Tyron Woodley successfully defended his welterweight championship for the fourth time – third technically considering his first fight with “Wonderboy” was a draw. You’d be forgiven for thinking he had just defended ten times and beaten GSP, because MMA media was awash with GOAT talks. Why all the bleating? This isn’t new, when Daniel Cormier won the heavyweight strap in July many declared him the GOAT. When TJ Dillashaw defeated Cody Garbrandt for the second time, plenty called him the bantamweight GOAT. After Max Holloway’s second defeat of Jose Aldo last year, people proclaimed him the featherweight GOAT. Let’s just pump the brakes. It’s easy to forget that our favourite sport is still just a baby trying find it’s footing in the world. 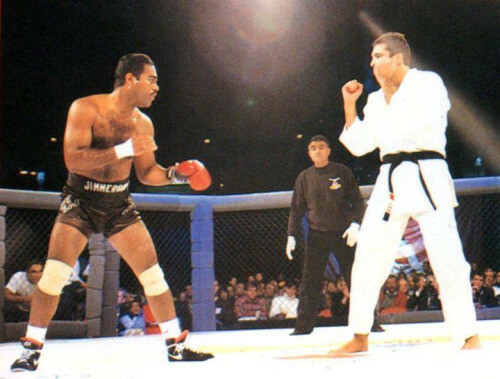 Mixed Martial Arts as we know it today officially began in November of 1993 with the UFC’s first event. Of course, Pancrase was doing something similar out in Japan earlier that year and Vale Tudo has apparently been around since the dawn of time, but I’m not prepared to bust out my taxonomic lens and quite frankly it undermines my overall point so let’s just pretend this sentence never happened. 25 years, that’s it. There’s evidence of wrestling dating back 15,000 years, The Football Association codified the rules of Football in England in 1863 and competitive running, javelin throwing, and hockey can all be traced back to ancient Greece. Boxing also finds its origins in ancient Greece, which is why it’s virtually impossible to attain GOAT status these days. Wladimir Klitschko reigned as heavyweight champion from 2005 to 2015 and no one calls him the greatest heavyweight of all time because the man most people think of in that position was active in the 1960s and 1970s. (Muhammad Ali if for some reason you don’t know who I’m talking about). When it comes to MMA it’s easy to get dragged into the cult of the new. Something exciting happens and we’re all there to see it, a shiny new thing; new statistic to weigh up. We can do this because we don’t have decades of set in stone consensus to contend with. There is little data to crunch and the axiom for greatness is still under construction. The original ultimate fighting champion was Royce Gracie, and at the time everyone thought he was best fighter alive. He may have been, but he also wore a Gi to the cage and fought a man wearing one boxing glove. Where do we draw the line? 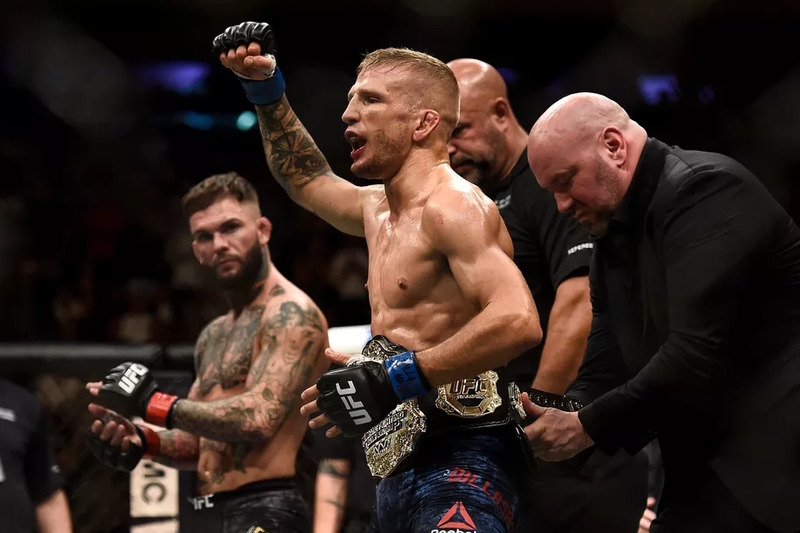 After TJ Dillashaw knocked Cody Garbrandt out at UFC 227 Joe Rogan said, “there’s no doubt, he’s the best” in reference to Dillashaw. No doubt Joe? Really? Dominick Cruz might have something to say about that. Open your history books, go all the way back to 2016 and you’ll find that TJ Dillashaw actually fought Dominick Cruz. Cruz won that fight and thus you would think impossible to call TJ the GOAT with “no doubt”. To be fair, the fight was razor thin and many felt Dillashaw should have gotten the nod. But at the very least, the tallest podium is disputed territory. 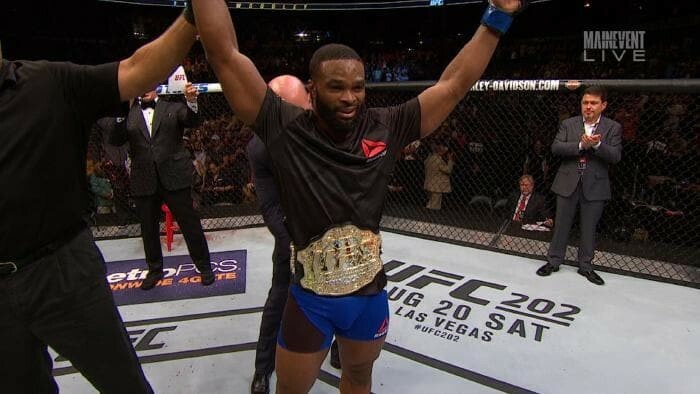 So, is Tyron Woodley in the conversation for greatest welterweight of all time? When he equals or surpasses Georges St-Pierre’s accomplishments, then yes, but he has a lot of ground to cover to get there. It’s rousing to think “this it, we’re here to see the greatest emerge”, but in reality, when we look back, we may find deflation in that sentiment. Now, for the time being, can we all just calm down, please? Thanks.